Parking is when you stop and allow your vehicle to stay in one place, whether or not you leave the vehicle unattended. Parking is allowed in many places on the road and in road-related areas and you should always obey any signs. At all times when stopping or parking, you must not open the doors of the vehicle so as to endanger bicycle riders, pedestrians or other road users. if your vehicle is a heavy or long vehicle, it must be parked in the minimum number of parking bays, if there are parking bays available. Angle parking is indicated by signs or road markings. It means you must park your vehicle at the appropriate angle to the kerb, as indicated by the sign or markings on the road and you must park entirely within a parking bay. If a sign states angle parking is allowed at an angle other than 90°, the driver must park with the front of the vehicle to the kerb unless a sign indicates otherwise. 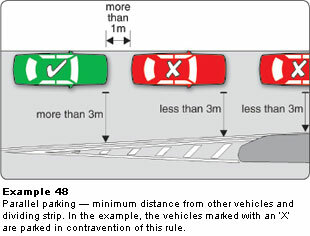 If a sign states Angle Parking but does not give the exact angle, you must park at 45° with the front of the vehicle to the kerb (Example 49) unless a sign indicates otherwise. 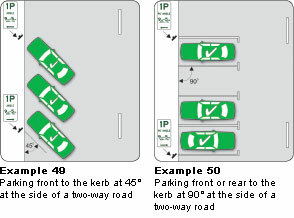 If a sign or markings indicate 90° parking, you may park with your front or rear to the kerb (Example 50) unless a sign indicates otherwise. a local council has granted an exemption. A vehicle is heavy vehicle if it has a gross vehicle mass of 4.5 tonnes or more; and a vehicle is long if, together with any load, projection, caravan or trailer, it is 7.5 metres long or longer. Please note: a No Standing sign has the same meaning as a No Stopping sign. 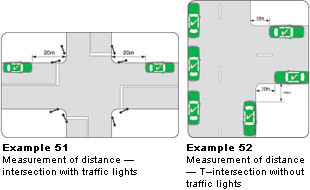 on a pedestrian crossing or within 20 metres before, or 10 metres after a pedestrian crossing (Examples 54 and 55). be likely to obstruct traffic on a road. A Clearway is a length of road indicated by a sign(s) on which stopping and/or parking are restricted during times of peak traffic use. The operating hours are indicated on signs at the start of and in the Clearway. You must not stop on a Clearway, including setting down or picking up passengers, during the operating hours. Buses are exempt. Where there is a time limit indicated by a sign, you must not park in the zone for longer than the specified time limit. It is an offence to exceed the maximum time limit indicated on the parking sign by placing more coins in a parking meter or ticket dispensing machine. If a fee is payable to park on a street a permit holder is required to pay for the time stated on the parking sign but does not have to pay for the additional time they are permitted to stop. Please note, the additional time allowance does not apply to parking spaces set aside for people with disabilities. You can leave your vehicle parked on the road at night without the parking lights on if there is a street light or other lamp alight that is making it clearly visible from a distance of 200 metres. Otherwise, if you leave your vehicle parked on the road at night, it must have front and rear parking lights alight. 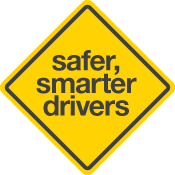 If a vehicle is 2.2 metres wide or wider, you must have the clearance and side marker lights alight for the safety of other road users unless there is street lighting making it clearly visible from a distance of at least 200 metres. to comply with another law. In each case, you must not park or stop for any longer than is necessary in the circumstances and you should move your vehicle as soon as you can. obey a 'Keep Clear' road marking. Tow-trucks, emergency vehicles and postal vehicles are exempt when acting in the course of their duties. Buses are permitted to stop to pick up and drop off passengers, but not on the South-Eastern Freeway and the Southern Expressway. 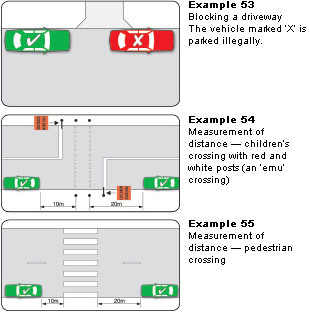 On the South-Eastern Freeway and the Southern Expressway, you may only stop in the emergency stopping lane and then only in an emergency.